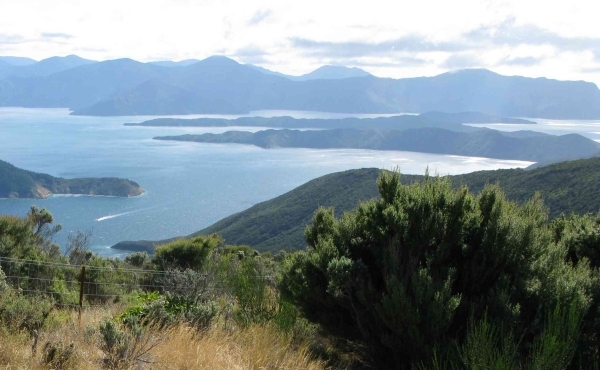 The Queen Charlotte Track, while not an official Great Walk, is considered pretty great by the thousands of walkers and mountain bikers that experience all or part of it each year. 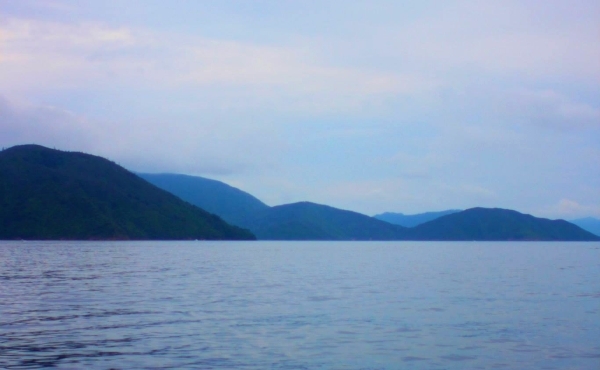 Experiencing Ship Cove and following in the footsteps of some of the world’s great navigators – Captain Cook and Kupe. 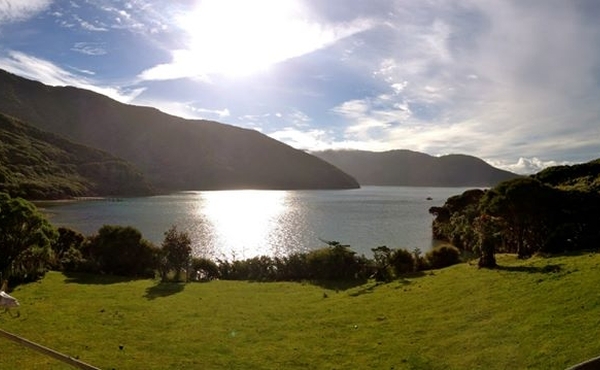 Today’s photo of the week is of the Nydia Lodge in Pelorus Sound, Marlborough. This DOC managed lodge sleeps 50 people and is nestled at the edge of native bush. A new partnership will provide more than $100,000 over three years for conservation initiatives on and around the Queen Charlotte Track. Recently Services Rangers Megan Farley travelled to Blumine Island in the Marlborough Sounds to carry out the biennial monitoring of the island’s orange fronted parakeet population. By Megan Farley, Ranger (Biodiversity Services) in Rangiora. 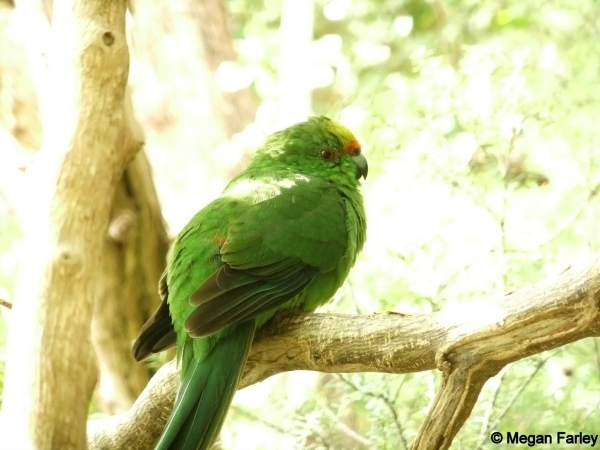 The orange-fronted parakeet (kākāriki karaka) is arguably New Zealand’s most threatened endemic forest bird species. 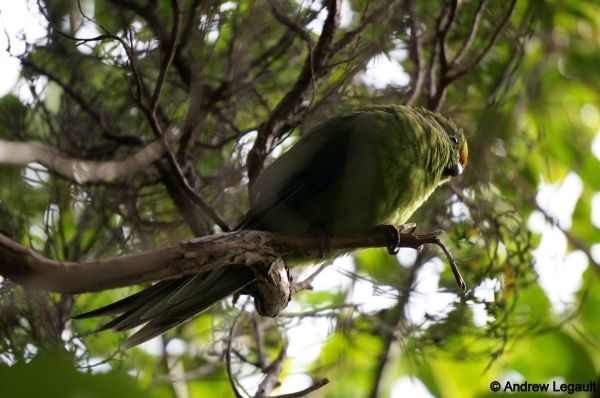 Maud Island has had a few issues for the parakeet population, due to a pair of falcon (kārearea) attacking fledging chicks, a lack of nesting sites, and a lack of water and food sources. Despite these setbacks a flock of eight orange fronted parakeets were found during this trip, all feeding together on olearia flowers (tree daisies) and bathing in the nearby stream. Of the individual parakeets that were found, three were original birds released onto the island over six years ago, while five were birds that had hatched on the island. Find more information on the orange-fronted parakeet on the DOC website or by liking Team OFP on Facebook. I have never been much of an outdoorsy person — I usually prefer to spend my holidays in the city or on a beach, close to mod cons and most importantly, hot running water. 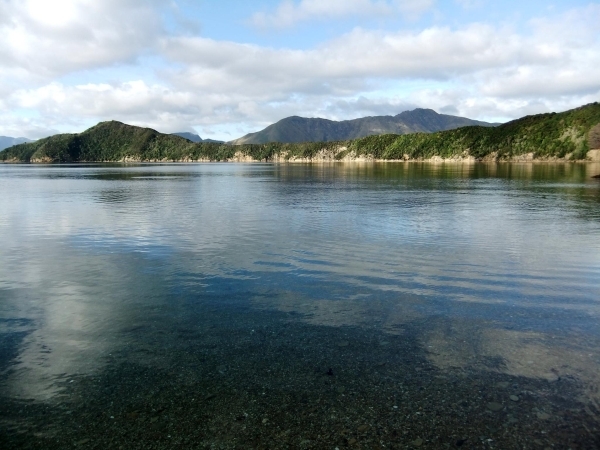 This summer, however, I decided to do something a bit different and disconnect from the world and spend a week on Arapawa Island in the Marlborough Sounds. 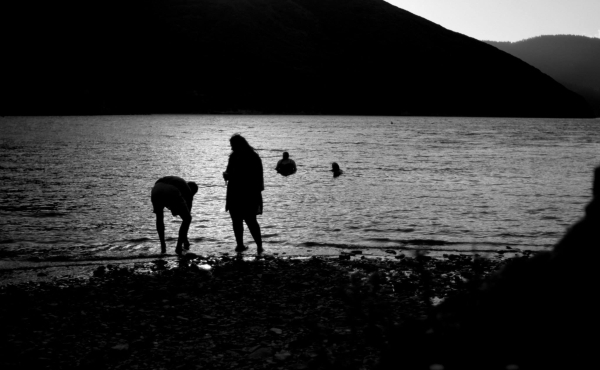 A week of camping, swimming, fishing and exploring might sound like bliss to some, but the thought of having no mobile reception, internet, or power, had me worried. Luckily I was not alone — 15 of us had made the trip down from Wellington, all filled with a similar sense of trepidation, but a keenness to have fun. First stop was the supermarket in Picton to pick up supplies, and then off to catch the water taxi. We had obviously ordered too much food and the boat captain probably wasn’t too impressed when we rocked up with box after box. 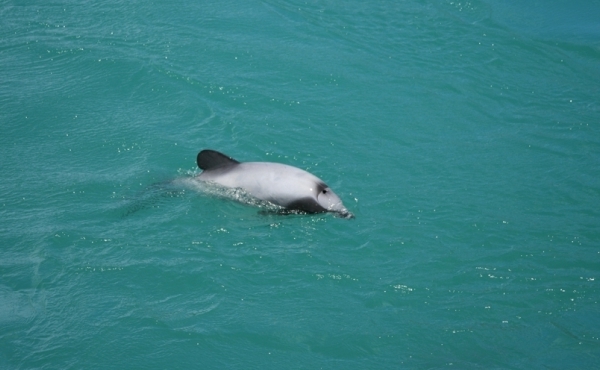 We were welcomed to the island on a spectacular day, with a single Hector’s dolphin greeting our water taxi as we passed through Queen Charlotte Sound. On reaching the island the first issue we had to contend with was the curious group of weka who were ready to investigate our bags and belongings and anything else that caught their attention. They sure do love shiny things and we had to keep our food hidden at all times. There are two DOC campsites on Arapawa, which are situated on either side of the island, and both are surrounded by beautiful bays and breathtaking walking tracks. 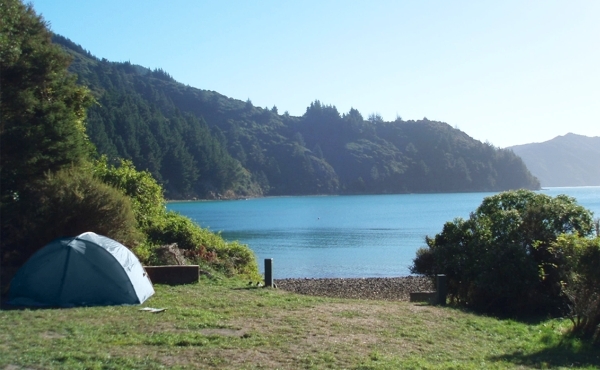 Wharehunga Bay campsite is a particularly beautiful spot. Swimming was a compulsory activity every single day despite some people being put off by the plethora of stingrays and jellyfish in the bay. The bay was also home to a good number of blue cod that can be caught at this time of year. Everyday we would discover a different track on the island that would lead us to some new discovery. We managed to discover a forgotten shipwreck, remnants of a historic pa site and a freshwater stream filled with massive eels. 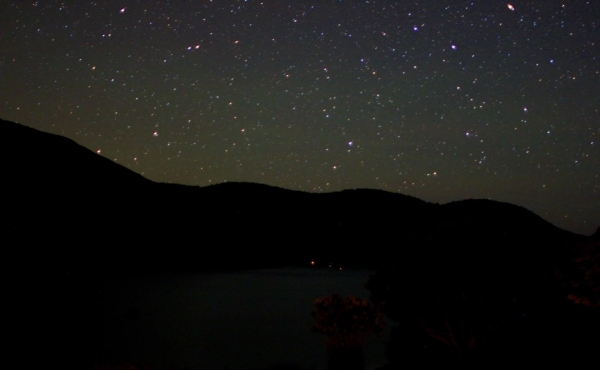 Absent of any other light pollution, the night sky was breathtaking and it was even warm enough to sleep out under the stars most nights. On the final day, we climbed the highest peak on the island called Narawhia. It was from the peaks of Arapawa Island in 1770 that Captain James Cook first saw the sea passage now known as the Cook Strait. It was a fantastic break away from the city and the crowded beaches and I can’t wait to go back and do it again.